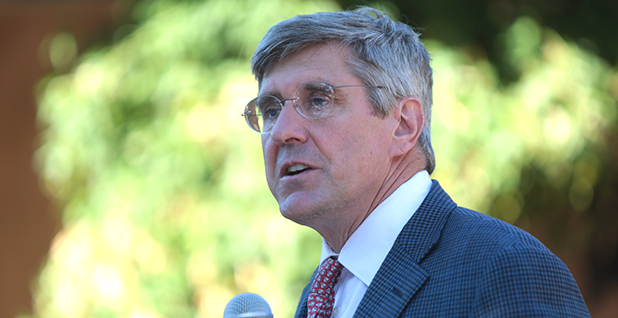 Stephen Moore, a senior fellow at the conservative Heritage Foundation, has labeled people worried about climate change "Stalinistic" and said climate scientists are engaged in a global conspiracy to make money. And after the Trump administration released the National Climate Assessment last December, he wrote an op-ed for the Washington Times saying the government is steering trillions of dollars toward "climate change hysteria and research." "The tidal wave of funding does reveal a powerful financial motive for scientists to conclude that the apocalypse is upon us," he wrote. "No one hires a fireman if there are no fires. No one hires a climate scientist (there are thousands of them now) if there is no catastrophic change in the weather." It's not clear if Moore can win Senate confirmation, although some Republicans have signaled their support for seating him on the seven-member board. Moore himself has referred to the Federal Reserve as a "swamp" and criticized current Federal Reserve Chairman Jerome Powell, whom he suggested should be fired. But in recent interviews, Moore has sounded a more conciliatory tone. "I don't want to be a disruptor. I want to be somebody who can really help Chairman Powell and the others on that board to construct the best pro-growth, stable price system that we can for this country," he recently told Bloomberg Television. Moore has attacked conservative groups that seek to craft climate policy. Earlier this month, he tweeted that student climate marches were essentially the "manipulation & exploitation" of children. He attacked conservative groups, including RepublicEn, which promote carbon taxes as a way of addressing climate change, as encouraging "economic destruction." He has retweeted false claims that carbon dioxide is not pollution and said that "state renewable energy mandates are a regressive green tax on America's poor." Moore's rhetoric around climate policy is outdated and sounds more like the early days of the tea party, said Bob Inglis, founder of RepublicEn and a former Republican congressman from South Carolina. Inglis said many Republicans now hear such "intellectually indefensible" rhetoric around climate change, including an outright dismissal of climate science, from their leaders and lose trust in them. What's more, he said, Moore doesn't have the proper academic background for such an important position. "He's no more of an economist than I am, and I'm not much of an economist," Inglis said. "I would never accept a nomination for the Federal Reserve Board, because I'm just simply not qualified, but what worries you about somebody who doesn't recognize their limitations, that's a dangerous person to have around." Moore, who has a master's degree in economics and not a doctorate, has been prolific in bestowing praise on Trump, whom he has called the "Mick Jagger of politics." Moore also suggested the president deserves a Nobel Prize in economics. Moore has been equally prolific in attacking climate policy. In February, Moore penned an op-ed for a conservative news site, CNSNews.com, that the Green New Deal would steer America toward socialism. "Conservatives have tended to laugh and sneer at the GND (me included), but these frontal assaults on free market capitalism are quickly becoming Democratic orthodoxy," he wrote. "Green is the new red, as the saying goes, and unless conservatives defeat and discredit these dingbat ideas, Donald Trump will be proven wrong. America will be on its way to becoming a socialist nation." Moore's nomination has been controversial because the Fed was designed to be free of political interference. Trump has also been critical of Powell over rate hikes, but the Federal Reserve has resisted the president's influence. Unlike the academic economists who constitute the board, Moore is an incendiary cable news pundit who recently published a book "Trumponomics," which lauds the president's economic policy, and was an economic adviser to Trump during the 2016 presidential campaign. Moore is unlikely to receive Democratic support in the Senate. Even some Republicans have criticized his selection, including Gregory Mankiw, a top economic adviser to former President George W. Bush and a Harvard University professor. Mankiw has criticized Moore, whom he called a "rah-rah partisan" incapable or unwilling to criticize Trump, for not addressing potential solutions to global climate change in his book. "Steve is a perfectly amiable guy, but he does not have the intellectual gravitas for this important job," Mankiw wrote in a blog post last week. He added, "It is time for Senators to do their job. Mr. Moore should not be confirmed." Meanwhile, within the Federal Reserve, there are some researchers who want it to take a more active role in better preparing the economy for climate change. A researcher at the Federal Reserve published a note yesterday that showed how climate change is one of three key forces transforming the economy, along with the shift toward an older population and rapid advances in technology. Climate change is one of the challenges that the Federal Reserve must consider as part of its mission to preserve financial and macroeconomic stability, wrote Glenn Rudebusch, a senior policy adviser at the Federal Reserve Bank of San Francisco. Without proper mitigation, global warming will cause growing losses to American infrastructure and property and will impede economic growth, he concludes. "Climate change has direct effects on the economy resulting from various environmental shifts, including hotter temperatures, rising sea levels, and more frequent and extreme storms, floods, and droughts," Rudebusch wrote. "It also has indirect effects resulting from attempts to adapt to these new conditions and from efforts to limit or mitigate climate change through a transition to a low-carbon economy." Fed Chairman Powell told lawmakers last month that he was looking into how the Fed should incorporate climate change into its planning. Rudebusch suggested that even though the Fed's tools for addressing climate change are limited, such as setting short-term interest rates, it should incorporate climate research into its economic outlooks.